In this study, we show that on average relatively pessimistic analysts tend to reveal their earnings forecasts later than other analysts. Further, we find this forecast timing effect explains a substantial proportion of the well-known decrease in consensus analyst forecast optimism over the forecast period prior to earnings announcements, which helps explain why analysts’ longer term earnings forecasts are more optimistically biased than their shorter term forecasts. 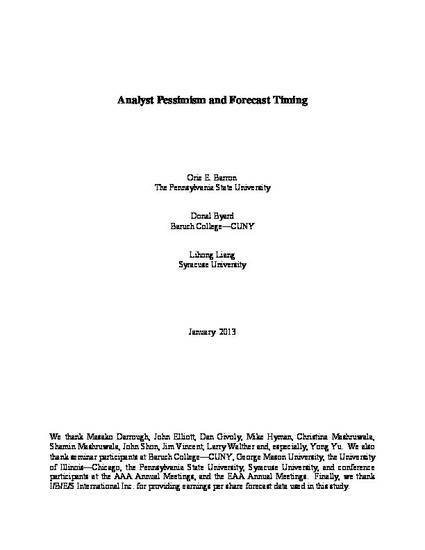 We extend McNichols and O’Brien’s (1997) and Hayes’ (1998) theory concerning analyst self-selection to argue that analysts with a relatively pessimistic view - compared to other analysts - are more reluctant to issue their earnings forecasts, with the result that they tend to defer revealing their earnings forecasts until later in the forecasting period than other analysts.